Fields: Plug-in hybrids will be the fastest-growing type of electrified vehicles. DETROIT -- Ford Motor Co. plans to invest $4.5 billion on electrified-vehicle technology over the next five years and more than triple the number of global nameplates it offers as a plug-in or hybrid, despite weak sales of those vehicles today. 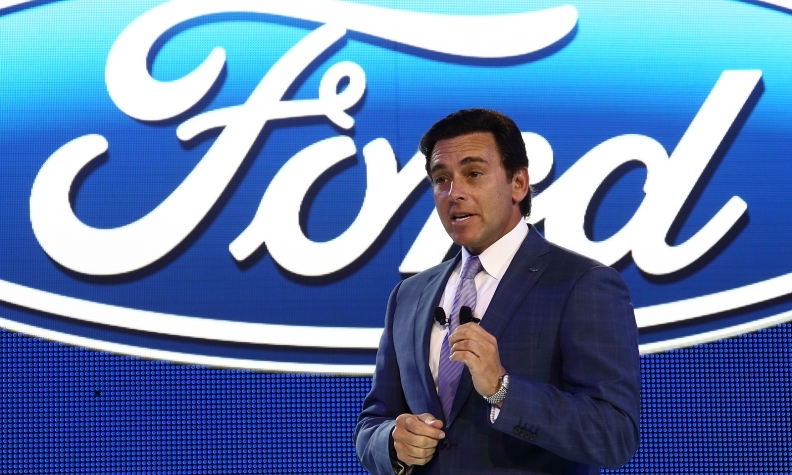 Ford CEO Mark Fields said the automaker would introduce 13 hybrid or electric cars by 2020, in addition to the six it offers today. Some would be versions of new or existing vehicles, while others would be offered only as electrified vehicles. He and Raj Nair, Ford’s product development chief, said the plan is driven by customer needs as well as by government fuel-economy regulations. Nair said more than 40 percent of Ford’s lineup will be offered as a plug-in or hybrid in 2020, up from 13 percent now. The investment represents Ford’s largest ever investment in electrified vehicles in a five-year span. Nair said that Ford expects to get the same return on investment on electrified vehicles as on gas-powered vehicles. Ford also said it will start selling an updated version of its Focus Electric in late 2016, though that is not one of the 13 upcoming vehicles. The Focus will be capable of traveling 100 miles on a full charge, up from 76 miles today, and of being recharged to 80 percent of the full range within half an hour, two hours faster than the current version. Ford also hinted that it plans to unveil a larger plug-in vehicle, likely an update to the Fusion Energi, at the Detroit auto show in January. During a media event at its engineering facility, it hid the car under a cloth next to a sign saying it was “top secret” until Jan. 11, which is the first day of the show’s media preview. Nair wouldn’t say how many of the 13 vehicles would be battery-electric vehicles vs. hybrids or discuss potential prices and driving range. “We fully anticipate that we’ll be introducing vehicles with a competitive range, both in the battery-electric and plug-in hybrids and hybrid vehicles during that time,” he told reporters. He conceded that low gasoline prices are hurting sales of Ford’s hybrids and plug-ins now but said demand would rise when gas prices increase, vehicles can offer improved driving range and consumers learn more about the vehicles. “We’ve got a lot to do to inform and educate the customer,” he said. 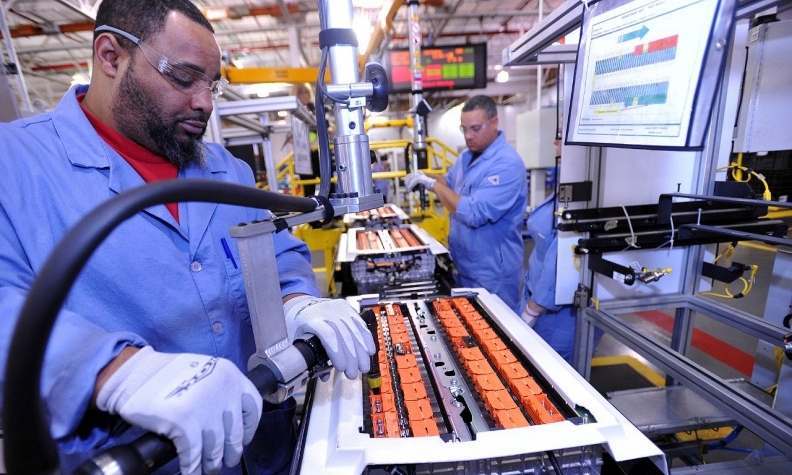 Battery packs are assembled for the C-Max Hybrid and C-Max Energi at Ford's Rawsonville plant in Ypsilanti, Mich. Separately, Ford also wants to develop ride hailing services that could compete with existing players such as Uber or Lyft, the company's head of research said Thursday. "Our vision is to be a mobility service provider, beyond building a vehicle that would be in somebody else's fleet," said Ken Washington, Ford's vice president of research. "We see this as a business we want to be in." Washington spoke at a media event at which Ford unveiled a pilot program that will allow employees working at the company's Dearborn, Mich., operations to use smartphone apps to hail rides from one building to another in specially designed Ford Transit vans. Without offering specifics, Washington said Ford is considering expanding the van hailing service beyond its corporate campus, offering an alternative to rides in private cars or journeys on city buses. Ford earlier this year outlined a series of moves to expand beyond manufacturing cars and trucks. The automaker, like established rivals General Motors or Daimler AG, is under pressure from investors to demonstrate that it can survive attacks on its business model from ride-hailing upstarts such as Uber, or electric vehicle pioneer Tesla Motors Inc.
One advantage Ford has, Washington said, is that it can design and manufacture vehicles so they can work "seamlessly" with software designed to connect riders with vehicles, or eventually drive autonomously. Washington said Ford expects within four years to field a vehicle that can drive itself with the driver "fully out of the loop." However, he qualified that by saying the vehicle could operate on its own in the right weather conditions. One concern automakers have is that the sensors that enable a self-driving car to see the road will not work properly in snow or rain.